Give your hands a firm grip with this Moab Lock-On with a gritty pattern, yet a soft touch. With a raised texture, this is a great grip for those who like thin grips or who have small hands. Providing a sturdy ride, the ODI patented lock-on design eliminates unwanted movement to maximize the rider’s control and comfort. 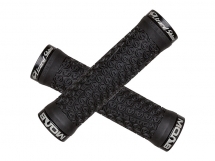 Lizard Skins lock-on grips come as a bonus pack which includes grips, clamps, screws and plugs.